Thanks to AiM, I have another impractical listing to try to try to chase for a Miata. Unfortunately, its nowhere near home so I cant realistically check it out. I emailed the guy and while it has 276k miles on it, it is reported to be running well and have a near perfect body. 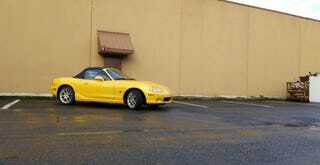 I love the sunburst yellow miatas so its exactly what I am looking for. It is listed for $2700 which makes it 100% what I would buy if it were local. I’d consider buying it when I fly up there for Oppo PNW meet and would take it to the meet rather than get a rental car. Then I would drive it all the way home to LA. Sounds risky to do with a Miata with that many miles, but sounds like fun also. So if someone has the time to go look, I would love some help. I really just want to know if it is truly as clean as claimed and has ZERO rust.